As I’ve shared with you guys before, Anthony, our third grader, was officially diagnosed with dyslexia almost two years ago. We knew there was something going on. We were pretty sure it was dyslexia. We started asking for testing that would confirm this in first grade, but it took a solid year of asking before the school would approve testing. The paperwork process for testing began in the beginning weeks of second grade. Dyslexia is a hereditary learning difference that does run in my husband’s family. He too is dyslexic and spent most of his childhood, and now adulthood, simply coping. It took months for everything to play out and we were finally given a diagnosis the last month of second grade. And still, once we were told yes, it is dyslexia, I felt pretty lost in regards of how we could help Anthony. At the official meeting when the diagnosis was announced, we were given a green pamphlet with very basic dyslexia information on it. Their final suggestion was to hold Anthony back and have him repeat second grade and begin a two year dyslexia program the following school year. No advocate. No hand holding. No resources other than the name of one book to look into and a little green pamphlet that gave a definition of the diagnosis and small bits of information. A smile and assurance that Anthony would certainly benefit from repeating second grade and a reminder that many famous people have been diagnosed with dyslexia. I trusted every person in that room. After all, I had built relationships with much of our administration as I had served on our PTA Executive board for a handful of years and at the current time worked closely with the principal as the schools PTA President. I honestly trusted that they would never steer us wrong. Where does a parent even begin? I think sometimes, no matter how diligent we are as parents, when things are really bad for your child, it can be hard to be that person that has the energy, diligence and perseverance to see through the forest for all the trees. Hell, it took a steady year of constant requests just to get the approval for testing. In our state a child must meet a specific amount of checklist requirements before there is a need for testing. Far too often struggles are dismissed as developmental issues, and I am finding this dismissal to be more common for boys. And revert back to that trust that you’ve build with the administration and teachers and you really just believe you are in good hands. But what I will tell you is, never ever give up. You are your child’s only voice when it comes to a meeting room full of administrators and school professionals, who after all, are simply running a business. A business with a budget, a business with test scores, a business with many state and Federal regulations and requirements that ensure their future funding. And sometimes it can feel like school is simply a place where they are manufacturing educations. So what is dyslexia? It is more than just writing your letters backwards, avoiding school work, dreading a writing assignment and reading slower than everyone else in your classroom. The specifics are varied from person to person- more severe for some and less severe for others. But the best definition that I have found is the one given by Ronald D. Davis- dyslexia is a disorientation of the brain. It is like sitting in your car and your car is still. The car next to you moves and you feel like you’re moving, but your not. I met Ronald D. Davis about six weeks after Anthony’s diagnosis. I went to a speaking engagement where this man told his life story and shared his struggles with what was finally identified as dyslexia. When he was little his mother was told he was unteachable, it was suggested she institutionalize him. His condition, compared to Anthony’s, was much more severe, but there were certainly similarities to Ronald and Anthony. As I sat in the back row of the auditorium listening to this seventy year old man tell the stories of his childhood there was something he said that brought me to tears. As a child when he would read, the words would fall off the page. Anthony regularly said this exact thing and I would grow so frustrated during the lingering and never ending sessions of homework that took place at our kitchen table. I was certain it was an excuse. Now I know his explanations are not excuses. They are real. I will share more of our story as I share with you over the course of February different resources we have found for Anthony. If you know someone whose child is struggling and dyslexia is a possibility, these are the four books I have purchased and read. I think each of them offer very helpful ideas and solutions. 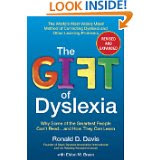 The Gift of Dyslexia by Ronald D. Davis. This book is written with much of Ronald’s personal experiences shared and his explanation of why some of the smartest people can’t read, and how they can learn. He has an entire chapter dedicated to symptoms of disorientation breaking it down into topics such as vision, hearing, balance/movement, time, as well as compulsive solutions and ability assessments. He also shares specifically how to implement his procedures that allow you to do something about the symptoms you see in your child. 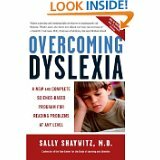 Overcoming Dyslexia by Sally Shaywitz. MD. This is a pretty popular book about dyslexia. It is scientific based and touches on solutions for many different reading levels. There is a section in the book that outlines a guide to age appropriate reading skill development and then later a section that breaks down clues of dyslexia as early as the preschool years on through adulthood. When Your Child Has… Dyslexia by Abigail Marshall. This is a nice pocket size book that gives a wide range of quick dyslexia related solutions, explanations, and things to consider. I love that she has a section specific to getting help at school including 504 specific accommodations. Once a diagnosis is given for your child, you must apprise yourself of what 504 is and the impact of properly completed 504 paperwork. Without it you can not gain accommodations and modifications for your child at school. 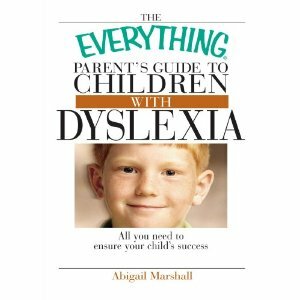 The Everything Parent’s Guide to Children with Dyslexia by Abigail Marshall. To me, this book is a more copious version of the previously listed book by Ms. Marshall. I really like the details she goes into that are state specific when dealing with the public school systems. In the coming weeks I want to share with you more information about 504 accommodations and modifications, as well as tools and other solutions that have worked for us. What about you? Have you dealt with dyslexia in your family? If there are books that you found helpful about the topic, please share your experience and ideas in the comments! I believe that dyslexia is just a learning difference. Unfortunately the term dyslexia now seem to include many disabilities that should not be included under dyslexia. I tend to agree with the definition given by the Learning Disabilities Association of US. Having taught many dyslexic kids I now believe that dyslexics are just wired differently. Dyslexia is not a disability it is just a different learning preference. I have former classmates who even if they draw with their 'wrong' hand would be able to draw better than me.But you don't call me dysdrawing. I have friends who will excel in any game they decide to play but not me.You won't call me Dysfootball. I have friends who can have one look at a room and say what to change around and when you do what they ask to change around the setting looks better. I cannot do this without actually moving the items around and seeing it. Like wise some children can do many things that I cannot do and yet cannot read as well as many of us can. They have simply been wired differently. It is like my computer printers. My daughter has 2 printers installed.No matter what I do I cannot print anything unless I change the setting! It is like a diesel car- you cannot run it by filling it with petrol. Teach a dyslexic the way he wants to be taught and he will do well in school. It is that simple. Your son is lucky you are such a great, persistent advocate on his behalf! I'm guessing it was hard to get him tested due to RTI (Response to Intervention)? I know that they are trying to get away from labels and pulling kids out of class. There's a huge push for inclusion and RTI right now that does make things harder if you are a parent and want your child tested. I completely agree, you as a parent have to be an advocate for your child. I do think the school should have given you some sort of guidance or resources for dealing with dyslexia. Crystal you need to do what you think is best. Ive been in a similar situation trying to get my son diagnosed with ocd. The school is not your friend. They are a conduit to get done what and how you want it done. Kids should be tested outside of school and then the school made to enforce the rules you set up. I have always believed that a parent is the child's best advocate. My son is now in college but the diagnoses and other struggles took years. Years. Stay on top of them like a lion. Great job for being such a great advocate for your son. It is hard when you know there is a problem, but others dismiss it. Thanks for sharing your experience. Children were given parents for love and support. Advocacy is a huge part of that. You're doing a wonderful job, Crystal. My fiance has dyslexia (as do his two boys). I can't even imagine how difficult it must be. I think its great you are advocating for your son and spreading awareness! My 8 year old has a learning disability – she has issues with decoding. We have a very active parent support group at our school that has been affective in bringing about changes. Have you looked at the Wright's Law web-site? Peter Wright is a law professor at the College of William and Mary who has written a book on advocacy (From Emotions to Advocacy). This is a good resource for advocating for your child. Have you seen the FAT City video? In this video, a Special Ed professor effectively illustrates how the classroom looks and feels to a child with a learning disability. Our advocacy group has tried to get the school to have the teachers watch it with no success. I touched on the issues we have at home with my daughter on a recent post, http://lifeinthemicro.blogspot.com/2011/02/let-her-stretch-her-wings.html. I'm fortunate to have a good relationship with our current Special Ed Teacher. The previous teacher was a screamer and was ineffective. I am anxious to see what you write about your experiences with your son. Just remember that your your kids best advocate. It kills me that you have to fight tooth and nail to get the services that they are federally mandated to give you. You are your child's best advocate, don't stop fighting. I am a former school teacher turned homeschooler who will assure you the school system does not have your child's best interest at heart. It is all about the bottom line. We have never dealt with dyslexia in our family. I am with you never give up when it comes to our children. What do you mean by words would fall off the page? Thanks for the information. This will be helpful to many families. I saw the word "dyslexia" when I was at HoH and had to come on over. My kindergartener has dyslexia. She is adopted and her bdad had severe dyslexia and she was having trouble so we had her privately tested. An independent evaluation cost us $1400 but we wanted to know for sure. The test results show that she is severely dyslexic. She scored extremely low in all three areas on the CTOPP. So I read all the books, took an Orton-Gillingham seminar, spent DAYS on the Wrightslaw website and prepared myself for my meeting with the school committee. They denied me every accommodation I wanted. I just wanted a 504 – but apparently the state of VA "does not recognize dyslexia." Those were the EXACT words the district person they brought in told me. How do you not recognize a known neurological disorder? The BEST hope for dyslexic children is to be identified by kindrgarten. In "Overcoming Dyslexia" Dr. Shaywitz talks about how they found out the brain CAN be rewired and dyslexia can be reversed if discovered by age 5 and intensely remediated with a multisensory approach (Orton-Gillingham), but most people do not find out until third grade when it is too late to reverse it. They can learn to read, etc. but it is much, much harder. I presented all of this information with charts, fact sheets, etc. to the committee and they told me she is doing what a typical kindergartener should be doing and they consider it developmental. It is so frustrating because dyslexic kids are usually SUPER SMART. You cannot compare them to the other kids, you have to compare their reading/spelling ability to where THEY should be at based on their other abilities. We held my daughter back a year but put her in a half-day transitional class when she was 5, now she is in full day kindergarten and still can't write the alphabet past the letter "F," yet they consider this normal. They finally agreed to test her only for speech and I just got a call on Friday that she tested at 6% so she will need an IEP. I can't wait to go back in that room, our last meeting was 3 hours. We are currently putting together a case to hopefully get the school district to pay for either private tuition or bring in appropriate instruction for her at our local school (which is what I would prefer). Well, I could go on and on. I checked your profile and it says you are in Texas. Texas is supposed to be a great state for dyslexia because they are the first state that has passed a law about dyslexia and early intervention. Were you given the "Texas Dyslexia Handbook"? It is seperate from special ed at the school. They will pay for an expert to work one on one with your child using a research based proven method (at least that is what I've been told). I am just so frustrated. 1 in 5 children are dyslexic. That number is HUGE! Yet nothing is offered to help them. Nobody believes me when I say the school is doing nothing. I guess we are just waiting to fail. I would recommend that you also read "From Emotions to Advocacy" and visit Susan Barton's website. She has a lot of info there. I believe you when you say the school has done nothing to help. My son is now heading into the 3rd grade and has dyslexia. It took one whole school year for the school to finally test him, then when the results came back they said he qualified for services, but the state of VA does not recognize dyslexia. I was floored, I dont know where to go now. if you have any suggestions I would love to hear from you. We're going through similar issues. This week is my daughter's meeting for her 504. It is frustrating that there's less than 90 days left in school and we're just getting this meeting. I'm glad that you're making progress and I hope that it continues. If you need that link to the Parent Centers, let me know as there are advocates for every state. What an amazing post! Your story is an encouragement to other parents and a resource to people searching for answers. 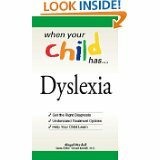 My son was diagnosed with dyslexia five years ago. Whew – we’ve come a long way. I hear ya when you say “no hand holding – nothing”. Schools need to be careful with what they say to parents because I believe they are then responsible to pay for all testing, therapies and treatment. Sigh – I won’t go into that. It can get frustrating. I thought I would share a couple of links with you. The first is what I did at home to help my son read and even (somewhat enjoy it) – OK that’s a lie. These are methods I used to make things less painful for all of us. See the post here: http://www.jennascribbles.com/struggling-readers/encouraging-young-struggling-readers-a-mom%e2%80%99s-perspective/ Note – I am a mom and not a reading specialist BUT – my son earned five A’s and two B’s one quarter last year while he was in sixth grade. If you would have told me that when we first started this journey I would have laughed in your face. Are you having a hard time finding books that your son can handle? This is tough!! I’ve been digging up titles that are interesting for kids/boys but still at a doable reading level. You can see all of the lists here – http://www.jennascribbles.com/category/struggling-readers/ Why is this info not more readily available? That kind of bugs me. I wish all books listed the reading level. But – we do the best we can. Oh another thing – (sorry for the long comment) I love the book: “The Secret Life of the Dyslexic Child: How she thinks. How he feels. How they can succeed.” It goes above and beyond flipping letters and reading difficulties.